We launched The Keywee Facebook CPC Tracker, based on analysis of data from hundreds of publishers, to help publishing leaders understand how changes to the Facebook platform affect their work. 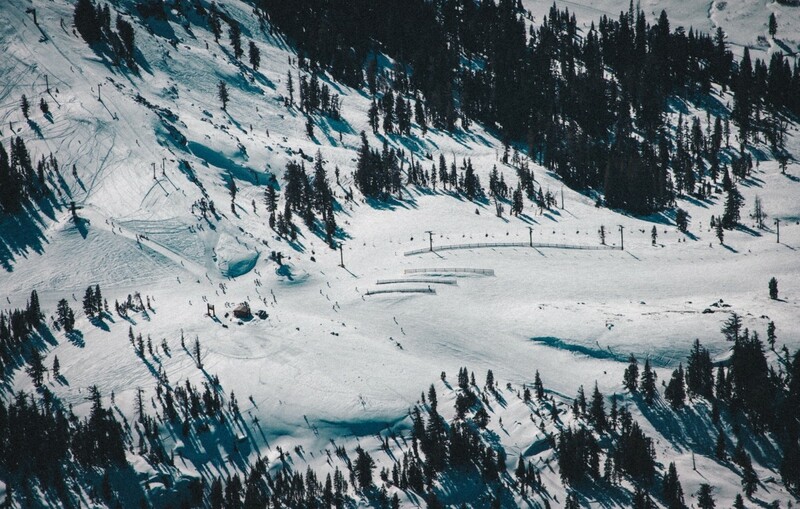 Each month we release new data along with relevant insights on content distribution. You can sign up for monthly updates straight to your inbox here and read past months’ updates here. This month, we saw some promising signs for the future of the publishing industry. The New York Times released its 2018 financials and, in addition to fast growth, there’s a healthy shift of revenue from print to digital; digital revenue accounted for over 40% of the total. Early internet brand DotDash had a strong year as well; after dividing their 6 domains into 15 to better serve advertisers, they saw a 44% increase in revenue YoY, largely from advertising. And Business Insider announced its best revenue year ever, driven from almost a dozen different revenue streams. As publishers look to build sustainable businesses, they are increasingly focused on reader engagement and loyalty. Research by Parse.ly showed that internal referrals make up 35% of publisher traffic. That’s more than any other category of referrals (social, search, etc. ), so it’s no surprise that publishers (like South China Morning Post) are focusing on smarter content recommendations. The Telegraph has been also been focused on growing its registered user base, which at the end of 2018 numbered 3.5 million. They now not only have email addresses for those 3.5 million users but have tripled their acquisition of daily subscribers. As owned audiences become ever important, we’ve seen an increased focus on newsletters, with new media companies like AirMail (from the former editor of Vanity Fair) and yet-to-be-named conservative media company (from National Review and The Weekly Standard editors) starting off with just newsletters. These follow in the footsteps of successful newsletter brands like theSkimm, which is now expanding to podcasts, and Morning Brew, which this month announced it has amassed 1 million subscribers. (For advice on taking your newsletters to the next level, check out newsletterguide.org, a project by the Shorenstein Center, The Lenfest Institute, and Yellow Brim). Of course, revenue diversification continues to be an enduring theme as well. We’ve seen a lot of news in the world of commerce & affiliate content. Vogue is doubling down on shoppable content with the introduction of the VogueWorld sub-brand, while Bleacher report is instead focusing on its own products, planning to sell over 600 distinct items in 2019. One thing is for sure – 2019 is already shaping up to be an eventful year in the media world. This month, we saw a 2% month-over-month decrease in CPCs. While that drop seems modest, when compared to last year’s 16% MoM increase in February, it’s quite notable. We expect prices to steadily increase throughout the quarter, so a decrease in CPCs from January, which is generally considered the cheapest month of the year, is quite unusual. However, while this low pricing was unexpected, it was a very welcome opportunity for publishers to scale on their campaigns at a better margin. In fact, we saw spend on Facebook double this month from publishers who focus on net positive ad spend from their paid content distribution efforts. Even audience development teams, who have typically focused on long-term audience growth, have been able to take advantage of this lower pricing. This is true both for strategic initiatives, like acquiring new members or subscribers, but also for more short-term goals, like showing immediate ROI on platform spending. If you’re interested in learning more about the mechanics of this process, and if it might be relevant for your team, email info@keywee.co for access to our most recent white paper, Audience Development: From Cost Center to Profit Driver. 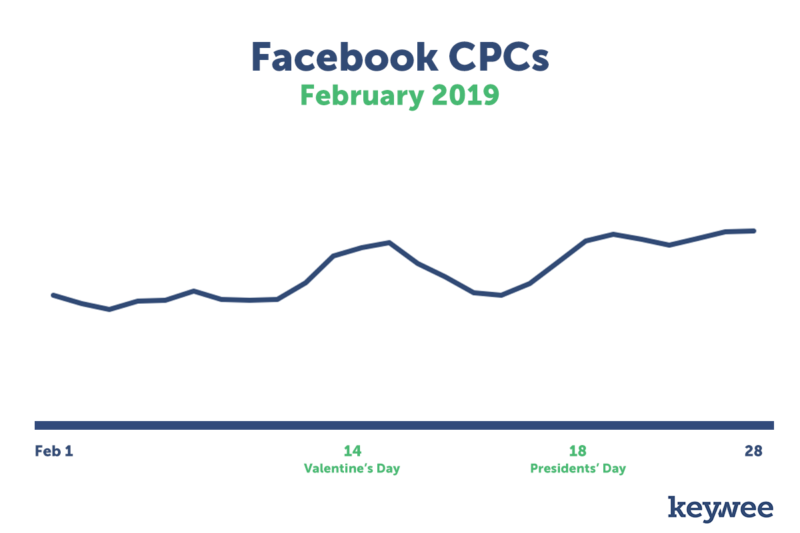 Although CPCs were lower on average in February, we did see some spikes during the month, notably around both Valentine’s Day and Presidents’ Day. In general, higher demand on the platform translates to higher pricing, so holidays with commercial elements (like Valentine’s Day gifts, or Presidents’ Day sales) tend to drive up the prices in the short term. If you have flexibility with your budget, and don’t stand to also gain from the increased demand that comes with holidays (from affiliate revenue, direct sales, or ad revenues), consider scaling down your campaigns around the holidays. At Keywee, we make stories relevant and powerful for the world’s best storytellers — like The New York Times, The BBC, National Geographic, Forbes, and Red Bull. Today, people aren’t coming to websites to search for content — stories find their audiences in feeds and apps. The upshot? Distribution is now the key for effective storytelling. Keywee’s platform unlocks audience insights using AI and data science, and infuses them into every step of the storytelling process: from topic selection, to story creation, to distribution and optimization. Keywee is backed by leading investors such as Google’s Eric Schmidt and The New York Times, and has been a fast-growing, profitable startup since its inception. To learn more, request a demo here. Nicki can be found in front of a spreadsheet, in her (tiny NYC) kitchen, roaming the aisles of a craft store, or halfway around the world. Subscribe to our newsletter for updates on the latest publishing industry trends, fun data analyses, webinar invitations, and more. Please complete this form and we will reach out to you soon.